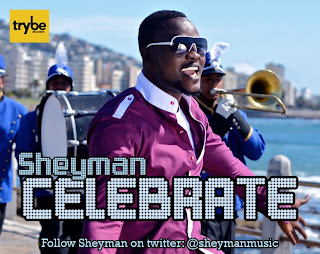 Brand new single from Trybe Records artist SHEYMAN - "Celebrate"
Born Ademoye Oluseyi, Sheyman is a renowned producer, singer, rapper and songwriter. Sheyman has 2 previously released albums under his former music label imprint Baseline records. His first album “Hotter than Fire” was released in 2008 which included hits like “hotter than fire” and “Iyalaya”, both singles enjoyed massive airplays and got several award nominations. “King Of Melody” his sophomore album was released in 2009 with hit songs like “Lie”. Sheyman has shown his versatility as a music producer over the years with hit songs such as “Tribute to Dagrin” performed by Sheyman and various artists, and “Shayo” performed by Bigiano. He has also earned a reputation as the go-to guy when it comes to mixing and mastering in the Nigerian music space. “Celebrate” is Sheyman’s first single off his upcoming album tagged “Zero to Hero”, his first album under his new deal with Trybe Records. The song is produced by MasterKraft. The album promises to be an exciting body of work and is billed for release later this year.